This legendary AlmazanKitchen pork chops are cooked on the stone plate cooker, near the frozen lake. Aged balsamic vinegar and aromatic butter that we used made that meat look and taste absolutely special. And of course at our site you can see how to make it for yourself and your love ones! Then let’s do it? Here we go! Preparing the cooking spot & forming a spicy butter bar. Make a campfire, preheat the stone plate cooker. Unpeel and smash 3-4 garlic cloves. Take handful of parsley, remove the stems and chop it very well with garlic cloves together. Take 3 tbsp. of butter. Marble it together with garlic and parsley. Form spicy butter bar. Oil up the stone plate cooker. Place 500g of free-range pork chops on stone cooker. Salt the chops then add 1 tbsp. 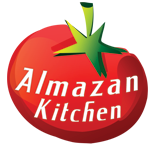 of AlmazanKitchen spice mix for pork. Lube the chops with 1-2 tbsp. of aged balsamic vinegar. Flip halfway, repeat step No. 5. Serve with special spicy butter bar. Your videos are out of this world. I watch them over and over. The food looks simply amazing. Best food videos on the Web. How can I purchase a knife? And, what in the price? What kind of stone is that? I have been trying all my life to cook pork chops that look ; and, I’m sure taste like that!